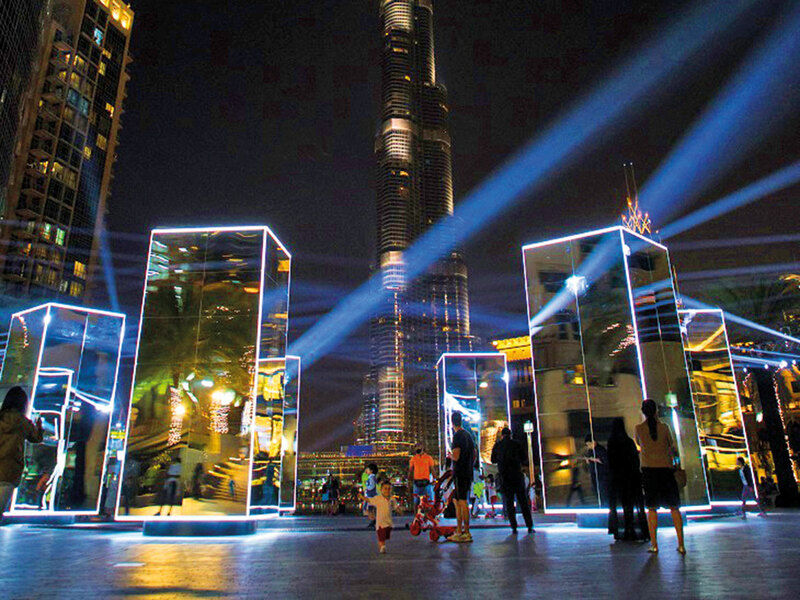 Dubai: A new attraction called ‘Downtown Light Park’ has been added to Downtown Dubai, featuring a dynamic light installation in the form of live performances and interactions with LED light pieces. Located at Burj Plaza, Downtown Light Park also offers direct views of The Dubai Fountain and the Burj Khalifa light show. Visitors can enjoy the light park after 5pm. Commissioned by DTCM, ‘Light ART Dxb’ is a spinning mirror-and-light art installation by lighting designer George Tellos, a Frankfurt and Athens-based artist. It is part of a citywide initiative to bring to the residents and visitors of Dubai new mediums of interaction. The installation was inspired by the book ‘Reflections on Happiness and Positivity’ by His Highness Shaikh Mohammad Bin Rashid Al Maktoum, Vice-President and Prime Minister of the UAE and the Ruler of Dubai. ‘Light Art Dxb’ is the latest in the line of art installations curated by DTCM in partnership with Art Emaar, an initiative by the Emaar Group.